Suicide Squad Cast @ Comic-Con 2016. 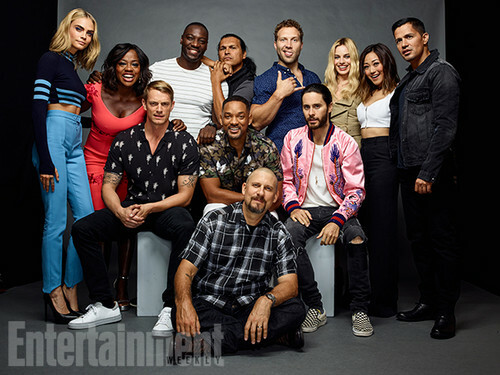 Cara Delevingne, Viola Davis, Adewale Akinnuoye-Agbaje, Adam Beach, Jai Courtney, Margot Robbie, Karen Fukuhara, नीलकंठ, जय, जे Hernandez, Jared Leto, David Ayer, Will Smith, and Joel Kinnaman. Wallpaper and background images in the Suicide Squad club tagged: photo suicide squad cast. This Suicide Squad photo might contain अच्छी तरह से तैयार व्यक्ति, सूट, पैंट सूट, pantsuit, पैंट्सट, अच्छी तरह से कपड़े पहने व्यक्ति, बाथरोब, स्नान वस्त्र, bathrobe, रात, नाइटवियर, nightclothes, नींदवियर, and रात के कपड़े.